Ninthlink is excited to announce the addition of three new members to our talented mix of creatives, engineers, marketers, copywriters, strategists, and visionaries. Ninthlink is excited to announce the addition of three new members to our talented mix of creatives, engineers, marketers, copywriters, strategists, and visionaries. These interns will train and help out in the departments of marketing, website design, and business development. Marshall Hunt, a San Diego native, is working closely with Director of Operations, Russell Arden. He will be assisting with web development for Ninthlink and its clients. Marshall will be a freshman at the University of California, San Diego this fall and plans to double major in both Math and Computer Science. Marshall’s objective for this internship is to learn the front and back end of website development and gain experience in the technological side of business. Noelle Tremmel will assist our Marketing Director, Megan Ayala, in areas of social media, SEO, and various marketing strategies for Ninthlink. Noelle is from Minneapolis, Minnesota and is going into her senior year at the University of San Diego. She will graduate next spring with a major in Marketing and a minor in Information Technology Management. Her goals for the internship are to gain knowledge and experience in the digital field of marketing and design. Kendall Valencia is a junior at Babson College in Boston. She’s getting her B.A. in business with a concentration in Strategic Management and Entrepreneurship. Kendall is from Ventura County, California and will be working with Ninthlink’s President, Jeremy Stallings, in business development. Her goal for this internship is to learn about the technical side of starting and growing a business. 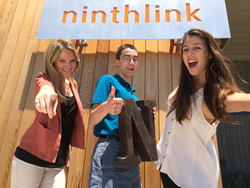 Ninthlink is a leading full service San Diego web design, development and Internet marketing agency. We build high performance websites and strategies that get results. Our team is a full service Interactive Agency prepared to educate, author, and implement all recommendations we provide your business.